Click on Thumbnail for MapWe make our way south with William Least Heat-Moon (LHM), in the late 1970s, heading down toward Selma, Alabama to learn whether Selma had changed 10 years after Martin Luther King's death. But, we drive through the friendly towns of Maplesville, Stanton and Plantersville where people wave to strangers. Click on the thumbnail of the map at right to see where these towns lie on our route. Leave a comment - are you a waver to strangers passing by in cars? "By midmorning I was following route 22, as I had from the Alabama line, on my way to Selma. The truck license plates said HEART OF DIXIE, and I was going into the middle of the heart. West of the bouldery Coosa River, I saw an old man plowing an old field with an old horse, and once more I wasn't sure whether I was seeing the end or beginning. Then an outbreak of waving happened - first at Maplesville, again in Stanton, again in Plantersville; from galleries and sidewalks people waved. Where folks are friendly." 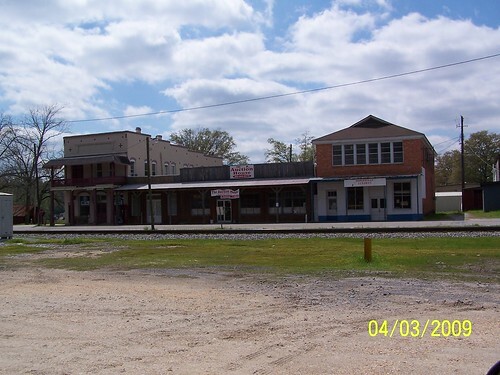 Downtown Maplesville, Alabama. Click on image to go to photo on Flickr. Waving. Such a simple thing to do. We wave when we want to capture someone's attention, either because we want to acknowledge them, or indicate trouble, or dismiss them. What LHM describes in the quote, the friendly folks in the south who wave from their stoops and sidewalks, is pretty much what I've experienced while traveling in the South. Actually, it is what I've experienced traveling in pretty much any rural area. When driving across rural areas of the United States, I was always surprised when, on a lonely road, I might pass a pickup going the other direction and the guy driving would either wave, or simply stick up his index finger off the top of the steering wheel. This man didn't know me and was probably quite aware that I was not from anywhere around there. Why? Because I wasn't driving a pickup but a sedan. So, it always was a breath of fresh air in a car filled with the smell of Cheetos or some other cheesy comestible snack to get that brief second of acknowledgment by a stranger before they zipped past. My father liked to wave to the train. My family has some property in a remote valley in Northern California that had train tracks running right through the middle. Our cabin was situated about 50 feet to the side of the tracks. Every day in the summer, one to two small passenger trains, and then a large passenger steam engine from my hometown, heading to the next town over, would go by. My father would stand by the tracks, usually shirtless and in shorts because it was often hot, and wave and put on a show for the tourists passing by on the train. He waved, all the while yelling "how are you doing?" "Look at you!" He would point at people and shout "Bless your little heart!" The tourists loved it. I don't know how many family trip photo albums or Super-8 movies stored in attics and boxes my father is in, but I'm sure there are quite a few of them. I should look it up on YouTube. Maybe someone has uploaded one from the 1970s! Driving through small towns, one often gets the same nice, friendly waves. Whether they are meant as such or whether they are simply convention with no feeling behind them is not for me to say. All I know is that the feeling of a place can be dramatically different if people are waving at you as you drive by in your car rather than staring at you from stoops or giving sullen looks. I at least have a better feeling about a place. As I've written before, small towns often have dark undercurrents behind them in a way that is much more malicious than cities, which hang their dirty laundry in the open for everyone to see. Small towns can be hotbeds of dirty secrets that fester because they are insular and because people's business can't be lost in a multitude of other things like it can in a city. In a city, darkness can hide in the open daylight. In a small town, darkness must truly hide. But waving puts a nice veneer on everything, and for tourists passing through, that's all that matters. Of course, I am not suggesting that Maplesville, Stanton or Plantersville have any of these problems. They are probably like other small towns throughout America. In fact, Stanton is known as the site of the Battle of Ebenezer Church, a desperate stand by Confederate forces after days of retreat punctuated by skirmishes to stop Union troops from taking the manufacturing center of Selma. Outnumbered two to one, they might have succeeded had reinforcements arrived as planned to attack the rear of the Union army. At such a site, where much blood was spilled, a simple wave to a stranger near the now tranquil battlefield nowadays holds a lot of symbolism. Great Website, Maintain the very good job. Thank you so much.